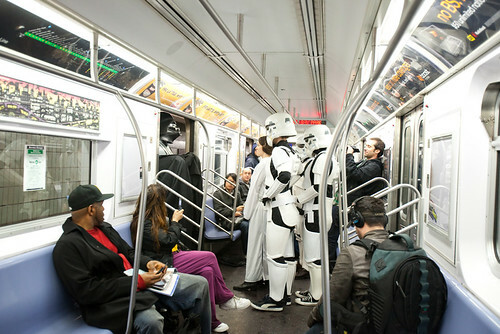 For our latest Improv Everywhere mission, we reenacted a scene from Star Wars on the subway. and took her to the doors on the opposite side of the train. Of course Darth Vader decided to pop in and join the party. The entire train car broke out in laughter! It always makes me so happy to see complete strangers laughing with each other. wish you guys came to chicago! 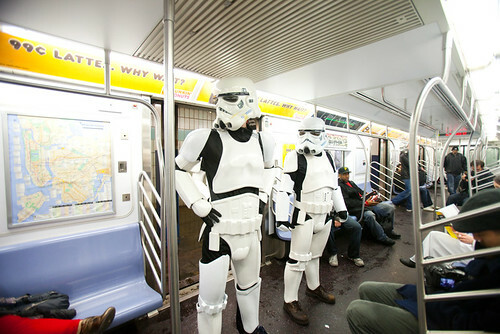 i'd love to run into you guys on our subway. Sounds like a lot of fun. Thanks for sharing! One of the best costumes you can have! This is absolutely awesome!! Great idea! Love it! oh, and my little bro is a star wars fanatic, so i showed him, he said "WHOA! AWWWWESOMEEEE!" haha. Love it! 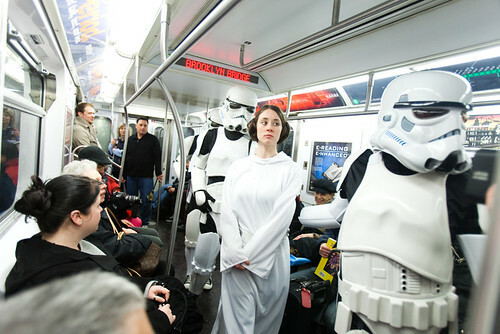 I don't know what I laughed at most- the guy's reaction to the book title, the people getting off when the Stormtroopers got on and they didn't even blink or look twice, the Stormtrooper who seemed to have a few costume issues, or the lady who almsot lost a hand in the subway door so she could get her shot! This is so funny! 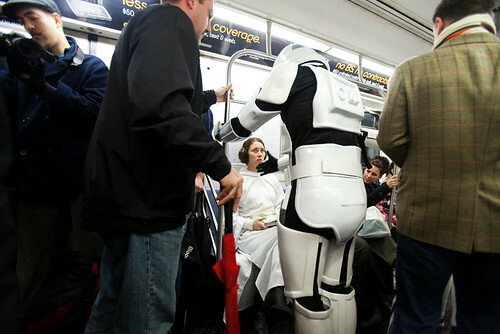 I was laughing the whole time, the reactions of the other subway riders were priceless. I'm sending this to my friend who is a diehard star wars fan! but I don't think I've ever seen that movie. Or maybe I just don't remember the scene. Oh well, it's still funny I guess. so hysterical - love this! In Chicago a few weeks before Christmas, they start up the Christmas train on the El. They have lights, and a Santa and everything. "Galactic Rebellion for Dummies"!! Too funny! This is awesome! All the details are absolutely perfect! They need to do this in ChiTown! That was so fun :) I can't believe how creative you guys are! AMAZING! i wish i could have been there!! too funny and i LOVE The last picture of the women holding on to the bar...her face says it all. Princess Leia reading the Galactic Battles for Dummies was right on point. The nosy person next to her trying to read the title of her book was a classic interaction on the train. Lol. 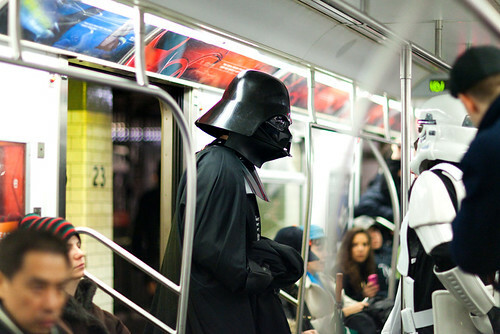 The icing on the cake was when Darth Vader got on. Made my day! Love New York! This is so brilliant! You guys are incredible. I love Improv Everywhere. I love, love, love the book title. Everyone was in character. You're brilliant! so fun! would love to see it happening in my country. 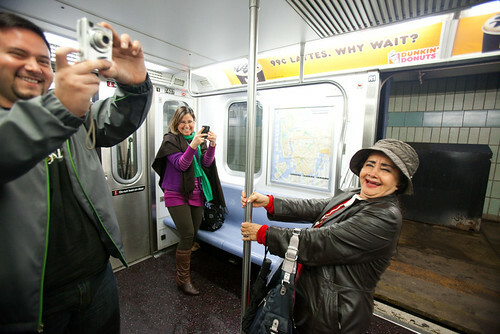 love the reactions of the commuters. so much laughter! Oh my oh my oh my!!! This had me laughing so much! I LOVED when the little kids were looking into the subway.. so confused! HA!! I'm just amazed how everyone either laughed or ignored what was going on. I'd be convinced it was some kind of killer in a suit...I would be entirely freaked out by this one. That was awesome! I wish those sorts of things were done here. How funny! Bwahahaha!!! Galactic Rebellion for Dummies... awesome! I wish you lived near *me*!!! Do people ever jump into stuff like this? how would you feel if, or how do you feel when or if people do? Hahahahaha, how funny, that's brilliant! I love that shot of Leia being captured. Too funny! I would have loved to have seen it in person! 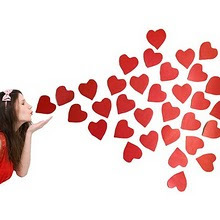 Your posts always make me smile... thanks! I love Improv Everywhere sooooo much. Random acts of happiness actually brings tears to my eyes!!! thank you!!!! P.s. the word varification is 'yayst' .. Yay St. indeed! So much fun! My whole family loves watching your videos. How are these funded? Do you get grants? Or is it just a labor of love? i like so much!! this is genius!!! hahaha!! 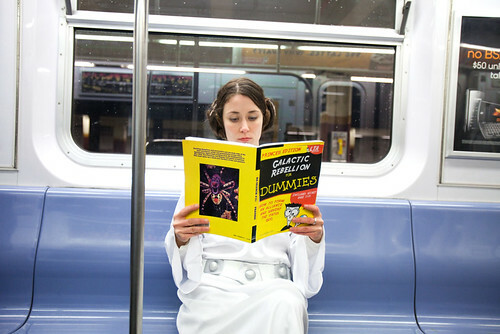 i love that she's reading "galactic rebellion for dummies" ha! I really thought this was going to end badly when I saw the super-solemn faces of all the people in the first few photos. I was picturing some heroic bodybuilder-type standing up to the Storm Troopers to rescue Leia. Incidentally, I have never seen the "Star Wars" movies and basically have no idea what's going on here. Fun! I had to share this video on my blog 'cause I enjoyed it SO much! Thanks for making the world a better place through laughter! That was just FUN, guys! haha, I wish something like that would happen in my town! The man beside the princess was funny too. There was a small article about this in the Finnish media! Weird, I'd say. Anyway this was sooooo gooood, wish something like this would happen in my city as well! This was on the Australian national morning show this morning. Awesome! the talents on the subways are always funny!! the E train at 53rd and lex platform always has the best singers/musicians! seriously! I always get my groove on while waiting for the train! My hubby saw a clip of that on ESPN and I said I bet that's Improv Anywhere by Color Me Katie. Is that weird that I knew that right off the bat?! :o) Great stuff. These Improv Anywhere skits are hilarious. I just found your blog and love it! Can you do Dorothy getting off the subway and saying, "I don't think we're in Kansas anymore"? Wow! i wish i was on that train. Hahahahaha, this is so funny! All the details and images are absolutely perfect! Full of funny! it's really great to video.